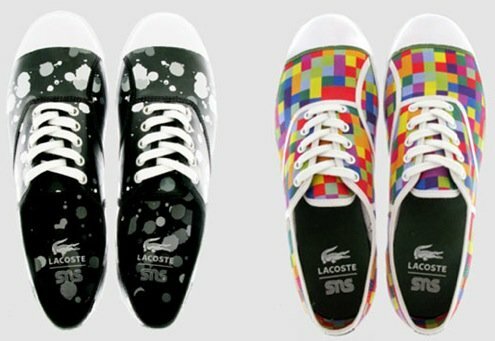 The Lacoste brand released its René model last year in celebration of the iconic brand’s 75th anniversary. 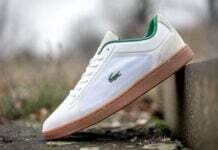 This year, Lacoste teamed up with Swedish-based SneakersNStuff and Swedish street culture legend Jonas Wiehager to work on the release of two new René sneakers. The “quieter” colorway of black, grey, and white was applied to the René that Wiehager designed, which also sports what is being called a “Superdrop” pattern. This pattern draws inspiration from drops of paint that fall from paintbrushes like the ones Wiehager himself used to create the unique art forms that made him popular. The second René was designed by the SneakersNStuff team and consists of multicolored squares that remind us of a celebration- which SneakersNStuff has reason to do as it continues to celebrate its ten-year anniversary. These René models will be limited to 124 pairs each and release in Stockholm, Sweden at the SneakersNStuff store on September 25th. Check out more pix after the jump.